Ethics, eh? Funny old things. A loosely knitted moral code pinned in place by a vague consensus, their primary purpose to prevent bored nurses from bumping off old people who leak. Easily pulled and stretched to fit over whatever issue is strutting the season’s media catwalk, ethics are your go-to guys whenever legislation seems a bit too cut-and-dried. And from an ethical standpoint, I confess this interview is dodgy to say the least. Precarious. Inadvisable even, fraught as it is with accusations of bias, partiality and a decided whiff of cronyism. If Simon Duke and his colleagues at The Tweeddale Press were in my position, well, they wouldn’t even consider it, their professional ethics gagging them as effectively as a balled up pair of sport socks. Even plagiarism no longer has a place on the all-you-can-cheat buffet these days, just ask Johann Hari. No, the professional journalist can only press his nose up against a computer and sigh with longing at all the glistening opinions begging to be passed off as his own. Me? Free as a bloody bird. Come Friday, I cast off the morals of my day job and confront my computer with something akin to a God complex. While I wait for a features editor out there to realise that my sparkling flippancy is exactly what their publication needs, I fill Fridays barking orders at myself to file 1000 words by 5pm, all the while still in my pyjamas sucking biscuit crumbs from my cleavage with a straw. So really in the grand scheme of things me interviewing Robert Wilkinson, writer and director of the hotly anticipated new play by The Tideline Runners, Human Interest Stories, shouldn’t be that much of a big deal. Okay, so I’m part of the cast – but only a small part. And I write with Bob for the Berwick Broadcasting Corporation – but, c’mon, not every month. Can’t see the fuss, personally. It’s not like I hack his phone on a regular basis. Reconstruction: how surprised Robert Wilkinson might look on discovering he's been the victim of a phone tap. On chatting with Wilkinson, it’s clear that he is a writer’s writer. The guy that you see shamelessly scene-stealing and grandstanding each month with the Berwick Broadcasting Corporation? Nothing more than a persona, an alter ego. Painfully shy away from the stage, he often seems as if he’s scanning the room for an escape route. His eye contact dips and swerves, his speech scurries along on tangents of stream of consciousness. Listen to him and you have an overwhelming sense that words are wholly inadequate to convey what is going on in his head. He leaves sentences half-abandoned in the traffic of conversation as he searches for better self-expression, a clearer way forward, before realising the futility of the task and slowing to an unfinished stop. It’s a surprise to discover that Wilkinson hasn’t had the benefit of a full education – after discovering booze he had to repeat sixth form, then dropped out of teacher training after a year and a half, and similarly failed to complete an Open University degree in English Language. However, his conversation is littered with literary, political and cultural references, his broad eclectic knowledge marking him out as an autodidact. He wryly acknowledges that libraries have played a large part in his education. 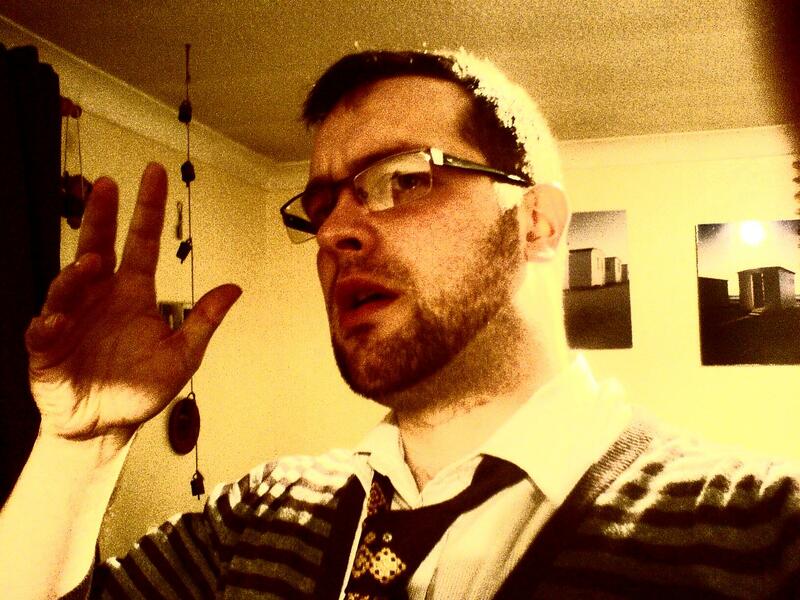 Wilkinson currently works in retail, writing at night and in any spare moment he can grab. I ask Wilkinson whether he regrets not gaining a recognised qualification, whether he thinks that access to a writing career would have been easier with the right bit of paper. Here we come to something of a dilemma. On the one hand, you have Wilkinson doing things his way, ferociously independent, single-minded and visionary, yet on the other there’s a man who by his own admission is not a completer finisher, someone who needs the input of others to avoid running the risk of promising much, yet delivering little. And Wilkinson is disarmingly frank: Human Interest Stories very nearly didn’t happen at all. In fact, if it hadn’t been for Miles Gregory, former Artistic Director of The Maltings Theatre, the chances are that it would never have seen the light of day. Gregory insisted; Wilkinson demurred. Gregory insisted; Wilkinson demurred. Gregory insisted and booked the theatre; job done, the script saved a lingering death from incessant rewriting and burial in a bottom drawer somewhere. And this is what it boils down to with Wilkinson and writers in general – confidence. Yes, yes, I know. Look at Wilkinson. Is he not the very embodiment of confidence? Always the first with a gag and a booming laugh, the front man of several bands and a superb on-stage ad-libber. Who could accuse him of lacking in self-belief? I repeat. He is a writer. Which is just a shorter way of spelling ‘personality disorder’. Each character on the page contains elements drawn from the writer’s own psyche. To present these characters to the public is to present yourself to the public and hope for approval. It’s a vulnerable position to be in, and I wonder if this pattern Wilkinson has of failing to finish things is avoidance; his admission of being easily distracted and drawn to anything novel and new a way of never putting himself truly to the test. If this is the case, then he has a hell of a lot riding on Human Interest Stories. Set in a fictional newspaper office, the play follows the fall-out of a phone-hacking scandal, but tells the story from the journalists’ point of view. Darkly comedic, it flies in the face of contemporary attitudes towards the press and asks the audience to find sympathy for those involved; how often it is a case of journalists living in the shadow of decisions made by those higher up. It’s a play about loss of idealism and the question of redemption. Wilkinson has certainly tapped into the zeitgeist, then. Why does he think today’s journalists feel so compelled to cross ethical boundaries? Is further legislation the answer? Researching the play, Wilkinson read every newspaper available. While his political inclinations may tend towards the Left, his intellectual curiosity needs to satisfy itself with all sides of an argument. This way he can more fully inform his characters. Only when he feels he has a handle on the issues involved does he finally start writing – pacing the floor, acting out scenes, and often not stopping until three or four in the morning. He confesses he’s not a great one for sleep, his head being full of too many damn words. And certainly Human Interest Stories has a lot of those damn words. Smart and intelligent, the play is unusual in that it makes no bones about its professional aspirations. There will be some who will sniff that it’s too clever by half, so sharp – as my mother might say – it’ll cut itself. They may have a point. It is a challenging play, harrowing in places. Heavy stuff for a Berwick audience? The dialogue romps along with the same clever wit and staccato delivery found in American films of the 50s and 60s. Wilkinson readily confesses that it’s a sensibility that appeals. Indeed, the whole play is startlingly televisual, with contemporary use of multimedia again setting it apart from more traditional community theatre offerings. You only have to look at this promotional trailer to immediately understand the aesthetic, and it begs the question why Wilkinson is writing for stage rather than screen. However, there is a pilot version of the play currently being put together with a view for television, and I suspect it is here that Wilkinson will really find his feet and make his mark. But in the meantime, rehearsals are coming to a conclusion and the finishing line is in sight, just two weeks away. How has he enjoyed directing? How does he feel about seeing his carefully nuanced script – currently on its tenth draft – being mauled by amateur actors? And this pretty much sums up Wilkinson’s directorial style. Yes, he has a very clear vision but at the same time he’s very fluid, adapting as he goes along, making full use of happy accidents and cast suggestions. He is also adept at pacing. 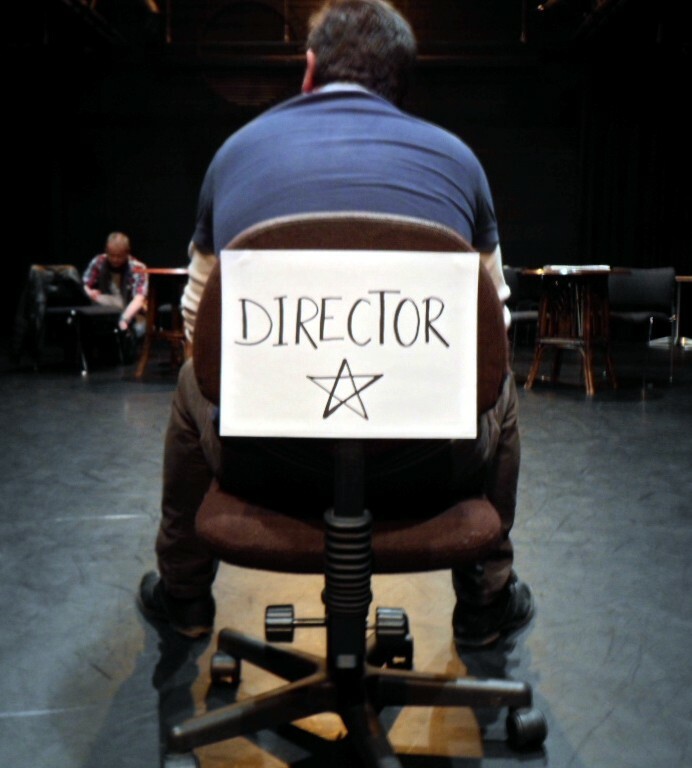 Amateur actors need more direction than their professional counterparts and it’s refreshing to find a director who is able to pace his direction – raising expectations and increasing his demands only as an actor gains in confidence. And fair enough. Because it is Wilkinson’s name all over this production – writing, directing and performing – and such a heavy personal investment is always perilous. How will he feel being on the receiving end of any criticism? He thinks about this. “I’m happy for people not to like it, for it to leave them unsettled. What would really piss me off is people coming out and saying it was all right.” He grimaces at the thought. You can see his point. Wilkinson is a driven man, private, difficult to know, acutely self-conscious, hopelessly modest. Yet it would be nice to think that even he can see that his achievement in completing this project – in putting himself out there and taking the risk – is always going to be more than just all right. The Tideline Runners present Human Interest Stories, 22nd to 25th February, 7.30pm The Maltings Theatre, Berwick-upon-Tweed.